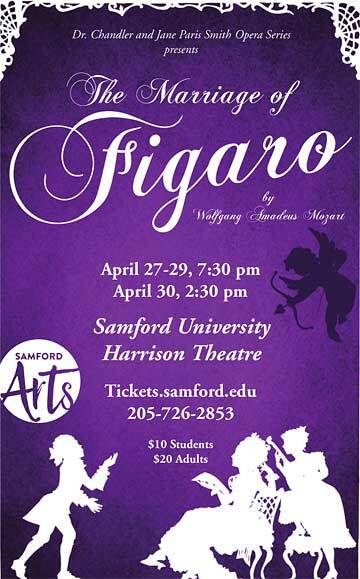 Samford University’s School of the Arts and Dr. Chandler and Jane Paris Smith Opera Series presents Wolfgang Amadeus Mozart’s The Marriage of Figaro, April 27–30. Show times are April 27–29 at 7:30 p.m. and April 30 at 2:30 p.m. Performances will be in Harrison Theatre. The Marriage of Figaro is a delightful comedy with twists and turns about love, betrayal and forgiveness, Kenning said. The opera is based on a revolutionary play written by French playwright Beaumarchais in 1784. “If you’ve never seen an opera, this is the perfect introduction to the art form. Sung in English, the music is stunningly beautiful, and the plot is hilarious and engaging,” said Kenning. Each year, Samford Opera students have the opportunity to perform a main-stage opera production and a scenes program. Additionally, opera students perform in the Birmingham community through workshops at schools and retirement communities, sharing their talents and honing their skills. Showcasing the students of the School of the Arts, the production includes a charming set, elaborate costumes, a full orchestra and outstanding performers, she added. Tickets are available online; at the Wright Center Box Office, Monday–Friday, 10:30 a.m.–3 p.m.; or by phone at 205-726-2853. Ashley Smith is marketing and communication coordinator for Samford Arts. Follow us on Facebook for the latest news and event information related to the Samford Arts.